Ah Quon McElrath to be honored. Ah Quon McElrath, longtime advocate of civil rights, will be honored at a luncheon Sunday at the Kapiolani Community College Cafeteria. McElrath, 90, has dedicated a lifetime to advancing the causes of universal health coverage, welfare reform and quality education. She continues to lobby for issues she cares about before the Legislature. 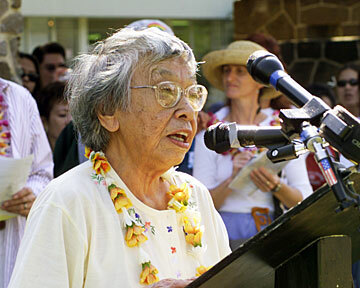 She also served as a member of the University of Hawaii Board of Regents from 1995 to 2003. Tickets to the 11 a.m. event are $50, to support the new Ah Quon McElrath Fund for Social Change and Justice with the University of Hawaii Foundation. Call 956-6915.